BEAUTIFUL! I love it! the colors are so pretty and her wings look natural. chobits always has pretty artwork. the blues and purples are very very nice. It's beautiful. 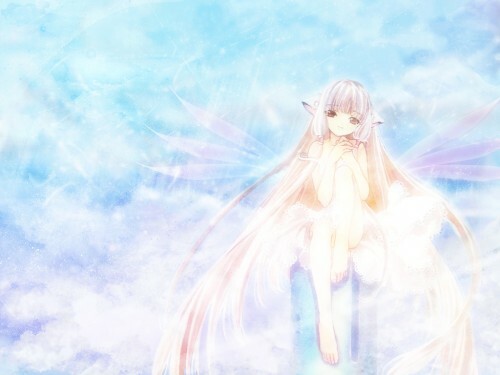 :) Chii looks so serene and her wings look nice. Background's a bit bright but that fits. It's beautiful, it makes me feel peaceful. Beautiful, I like the original version of this picture but you have done a very good job!